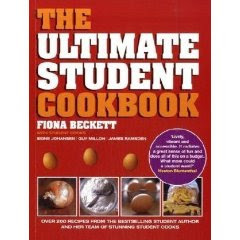 This is the forth student cookbook by Fiona Beckett following on from the Beyond bake beans series. This forth book is a compilation of the most popular recipes from the three previous books along with some new recipes by three student cooks. The students are Signe Johansen, Guy Million and James Ramsden who are all university students with a keen interset in cooking. They all have their own food blogs and are regular contributors on the beyond bake bean website and facebook page. As well as contributing their own recipes to the book they have added really useful comments and tips throughout the whole book. There is even a foreword by Heston Blumenthal. The book starts off with some really useful information on basic kitchen kit, store cupboard ingredients, shopping on a budget, healthy eating and drinking and food hygiene and safety. The book then moves on to its collection of over 200 recipes. They are divided into 4 chapters; quick and easy recipes for 1 or 2, cheap and tasty meals for 3 or 4, flashy show-off recipes and yummy puds, cakes and cocktails. Through out the book there are lots of mouthwatering pictures of the recipes and lots of tips. Tips at the end of the recipes from the three students include useful advice such as money saving tips, ideas for left overs and extra tips on how to do certain steps of the recipe. Many of the recipes also have a handy list of variations you can try so you'll never be stuck for inspiration. The recipes cover the basics such as the perfect mash potato, how to cook rice and pasta, as well as many delicious sounding recipes for everything from chilli con carne, homemade kebabs, curries and pasta sauces to delicious desserts like strawberry pavlova and chocolate mousse. All in all this is a very comprehensive collection of student recipes with lots of great tips and advice. And even better it is great value for money too. The ultimate student cookbook - Fiona Beckett with student cooks Signe Johansen, Guy Million and James Ramsden. Published by Absolute Press in 2009. Hardback, full colour illustrations, 288 pages. Thanks to Absolute Press for sending me a review copy of this book.